Run Time: Approx. 45 min. The stars of the produce aisle are back in an all-new adventure that addresses a multitude of issues facing kids and parents alike. 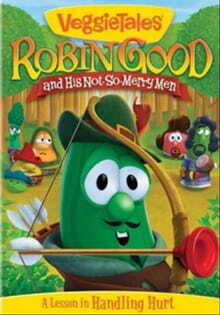 VeggieTales®: Robin Good and His Not-So-Merry Men is a charming animation that might actually step on a few toes. Times are hard in the medieval village of Bethlingham. This once-proud hamlet, known for the quality of its pork products, has fallen on times so hard children are forced to celebrate birthdays with birthday gruel instead of the traditional ham. Robin Good (Larry the Cucumber) and his band are out to change all that, with tireless fundraising activities. Fundraise from the rich and give to the poor, that’s their motto! But when times get tough, the rich aren’t as generous as they once were. Worst of all, the greedy Prince declares that all hams now belong to him. At this point adults—especially those in middle management—will feel decided sympathy for the town Sheriff, ably portrayed by Bob the Tomato. He doesn’t agree with the Prince’s pork policy, but it’s his job to enforce it. What’s a tomato to do? Where should he draw the line between standing up for what’s right and just doing his job? Robin’s men, discouraged by the overwhelming need around them, decide to take back those hams from the evil prince. He doesn’t have any right to them so why shouldn’t they break a bad law in a good cause? It’s a good question, and one some adults may wrestle with as much as the veggies in the tale. Children will note that actions have consequences—like refusing to do what’s wrong and losing your friends in the process. Robin Good includes all the features we’ve come to expect from a VeggieTale; clever writing, multiple life lessons, fun music, English peas with French accents (a personal favorite), and enough plot wrinkles to make it worth watching almost as many times as little ones will want to. It’s hard to resist the charm of bathroom-plunger-tipped arrows flying hither and yon, a nod to the famous “who’s on first” dialogue, or Robin’s consternation when his cunning plan to stop a marauding giant goes awry. In addition to the main feature, the DVD holds the story of “Lenny and the Lost Birthday” about a young asparagus who wakes up ready to celebrate on his special day, only to find that everyone has forgotten his birthday. It’s a sweet nod to classic children’s book Alexander and the Terrible, Horrible, No Good, Very Bad Day with a reminder that you’re special to God no matter what, and an illuminating lesson on Leap Year. Drugs/Alcohol: Something of a ham overdose, but that’s gluttony. Violence: Larry appears wearing a large bandage and sporting a crutch (and has an offstage fall); plunger-tipped arrows fly; a few hard landings; a giant threatens to attack; two small peas are nearly squashed (but our hero arrives in time). Spiritual Themes: Giving burdens to God, doing what’s right in the face of peer pressure, giving to those in need, not giving in to despair, finding self-worth from God.